Intense all-night negotiations have come to an end as EU leaders reach agreement on budget proposals for the rest of the decade. EU Commission chairman José Durao Barroso’s interpretation of the 19-20 Feb summit on the budget for the next seven years highlights quite accurately the best and the worst of the difficulties the EU is passing through and, in my view, shows the first fruits of British PM David Cameron’s recent challenge announcing a referendum on the link UK-EU in five years. The Commission would of course have preferred an outcome closer to its original proposal. As you know, in 2011, the European Commission made a proposal that was more ambitious than this result today, a proposal that received the support of a clear majority of the member states at that time. But I must recognise that the political deal made now was the highest possible level of agreement that the Heads of State and Government could reach at unanimity. The levels agreed today by the Heads of State and Government are below what the Commission considers desirable given the challenge of promoting growth and jobs across the European Union in the coming years. ¿An important catalyst for growth and jobs? We have agreement on a new and very important Youth Employment Initiative… (More resources) for research and innovation (the programme called Horizon 2020)… for Erasmus For All. We will also have, and this for the first time, a dedicated programme for SMEs, a programme called COSME. It also makes our budget more modern. For the first time, the European Union is cutting its multiyear budget at the behest of the core countries subsidizing the bloc’s poorer members, which had advocated for increases. 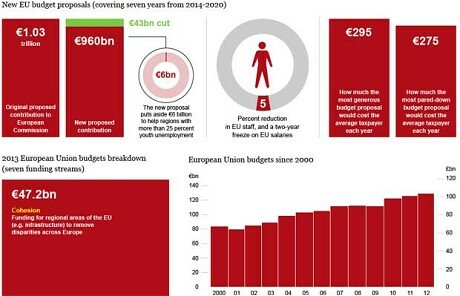 The 2014-2020 budget is expected to amount to 960 billion euros (about $1.3 trillion). The negotiations highlighted diverging national interests within the European Union, which could fracture further as a result of the budget cuts. While the spending reductions are intended to contain rising euroskepticism in creditor countries, they also could prompt newer EU members to question the willingness and capacity of Western Europe to support development in the east.